60982 In the Orchard In the Orchard, 1891, Smithsonian American Art Museum, Washington, DC. American Impressionist Painter, 1862-1938 American painter, illustrator and teacher. He attended drawing lessons at the Normal Art School, Boston, MA, and art classes with W. A. G. Claus. 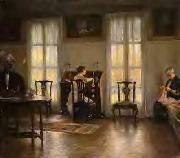 From 1877 to 1880 he was apprenticed to a lithographic company in Boston. 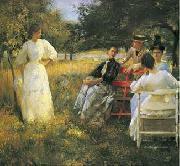 In 1879 Tarbell entered the School of the Boston Museum of Fine Arts, where he was a pupil of Otto Grundmann (1844-90), a former student of Baron Hendrik Leys in Antwerp. In 1883 Tarbell left for Paris with his fellow student Frank W. Benson. Both Tarbell and Benson attended the Acad?mie Julian, where they studied with Gustave Boulanger and Jules Lefebvre. They travelled to Italy in 1884 and to Italy, Belgium, Germany and Brittany the following year. 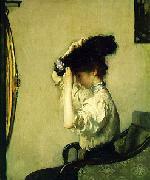 Tarbell returned to Boston in 1886. 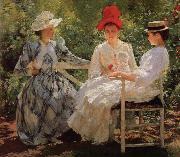 Initially after his return, Tarbell made a living from magazine illustration, teaching privately and painting portraits. 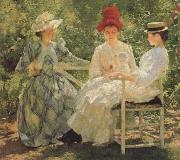 In 1889 Tarbell and Benson took Grundmann's place at the Museum School.